See that small dog in my friend Sue’s arms? Her name is Sweet Tea and sweet she is. She attracts attention like a magnet. And she acts pricey. 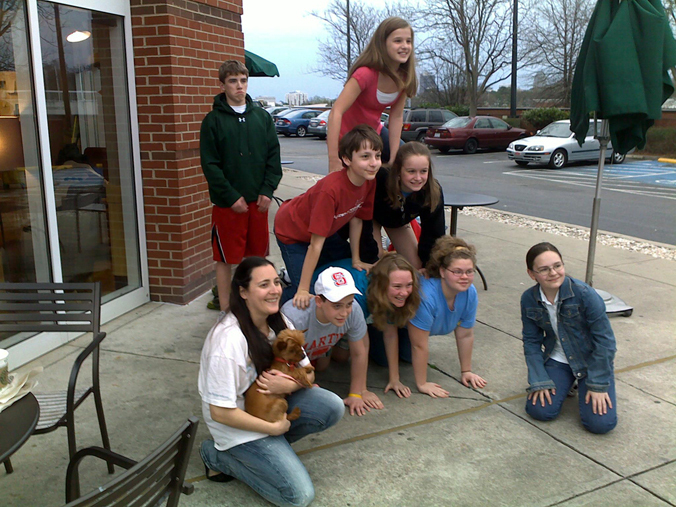 For the 45 odd minutes that we were there outside the Starbucks close to campus, we had about 10 people who looked at her and smiled as they walked by, 4 people who wanted to pet her, and finally two groups of students (one seen here) who wanted a picture with her for a school project. I was slow with my phone camera when the first group of students had their shot taken. Which made me not happy since it was a nice story telling shot. But I totally underestimated Sweet Tea. A few minutes later, we have another group stopping by. They asked me if they could have a shot with the dog. I pointed to Sue and said “Ask the owner”. They made a pyramid because they also needed a shot of that, and this way they could kill two birds with one stone. Kids make me happy. Kids making pyramids and having fun make me very happy. The Oscar for the most happening person of the month goes to Sweet Tea the dog. This is sweetest! Happiness lies in small things around.